Hottest Part 103 Ultralight Yet? Possibly, and Coming to America! Two years ago at my favorite European airshow, Aero Friedrichshafen, Bill Canino of Sportair USA urged me to go look at a cool Part 103 project. With a general appearance resembling a Chance-Vought F4U Corsair military fighter, designer Jörg Hollmann's ultralight Corsair is reasonably authentic including its highly distinctive inverted gull wing design. Two years ago when I saw the bare bones example — exhibited for this small shop design and manufacturing organization in BP Oil's display stand — it was easy to get excited by the concept but less obvious to imagine how it might eventually look. 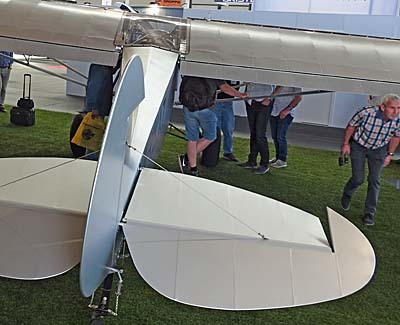 At Aero 2018 the visual mystery was solved. Anyone who has admired F4U Corsair's angular wings will be drawn to ultralight Corsair. 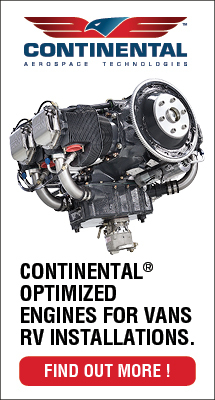 Even the engine mimics the original's Pratt & Whitney R-2800 Double Wasp, except at ultralight weights and power. 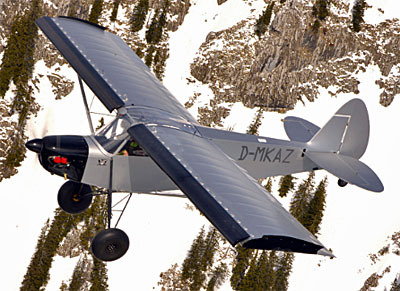 Jörg chose a three-cylinder Verner radial to power his diminutive aircraft. The whole package was fascinating to those of us who enjoy single seat designs. The truly good news for Yankees who might want to own such a creation is that Sportair USA boss Bill has placed an initial order. For a tiny company, such a launch customer greatly increases the likelihood that this unqiue entry will makes it way into American skies. Of course, Europeans also recognize both the F4U resemblance and the coolness of this design effort. While fabric covered (also for lightness), Jörg refers to his internal carbon fiber tube structure as "a unique carbon-spaceframe technology." He added, "This property right-protected technology combines high strength with an unequaled low weight." Seeking a very low weight is partly a maneuver to steer clear of tough certification rules via the Part 103 / 120-Kilo Class / SSDR unregulations. A light design permits Jörg's design objectives. 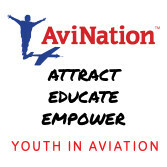 "Due to the light weight of the structure we were able to include all the ingredients for a high performance aircraft: outstanding aerodynamics, a strong engine with a big, efficient propeller, a short and aerodynamic landing gear, as well as effective flaperons." The carbon-spaceframe is effective, resulting in a calculated +9 and –6g ultimate load strength. 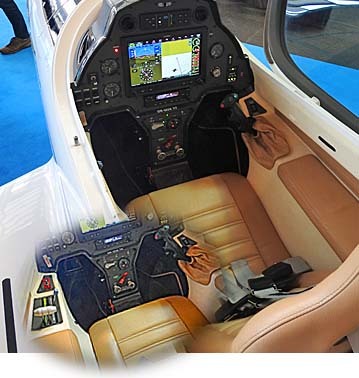 "Furthermore," Jörg said, "the complete cockpit area is constructed as a Kevlar-reinforced safety cell." A ballistic parachute will further enhance safety. In our article from 2016 we unveiled Corsair in bare carbon fiber bones. 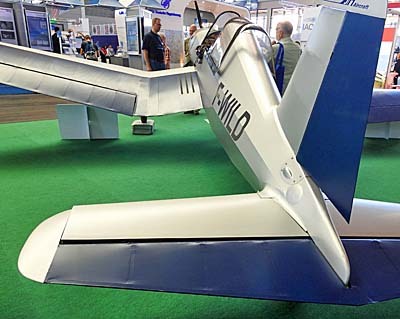 That article also repeated Jörg's prediction that it would fly before Aero 2017. That didn't happen, however, Jörg said it is now ready for flight. 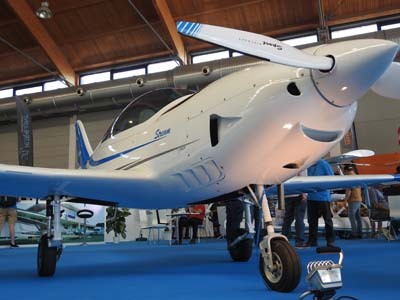 "Corsair would have flown before Aero 2018 but a lack of ideal weather prevented that. 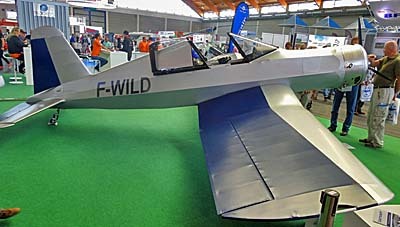 We prefer calm winds and clear weather for a first flight in such a light aircraft," he explained. Because weather at Aero 2018 was warm and sunny, he hopes to get airborne in short order. 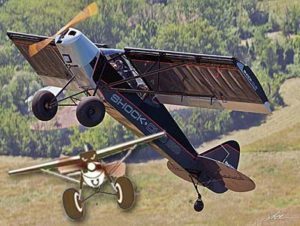 Not only can Corsair meet USA's Part 103, it also can qualify for Germany's 120-kilo class and Britain's Single Seat DeRegulated (SSDR) class (article). Jörg explained, "Corsair currently fulfills the British SSDR regulation. An adapted version will comply to FAR Part 103." 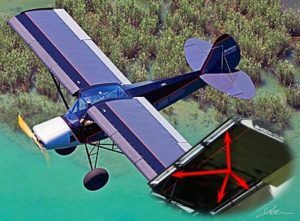 Although Corsair has ultralight proportions, it is versatile about pilots it can contain. 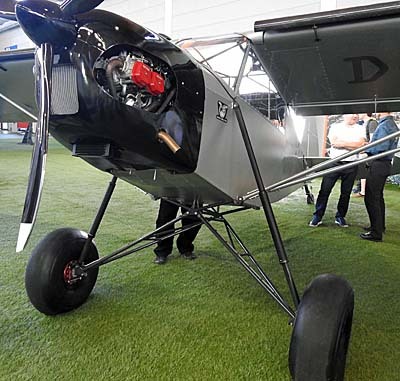 "The ergonomics have been optimized with the help of our local flying club," indicated Jörg. 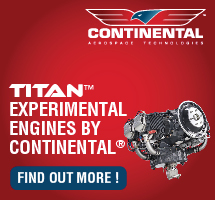 "It is suitable for pilots ranging from 5 feet 4 inches to 6 feet 8 inches (1.60-2 meters)." The inner cockpit is 23.6 inches wide (60 cm). Corsair's seat is adjustable in four length/height positions. The seat back incline is independently adjustable in 11 positions. Rudder pedals are also adjustable and even the joystick offers two positions. 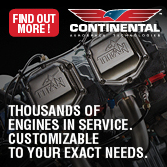 For more information, contact JH Aircraft or in the USA, go to Sportair USA. 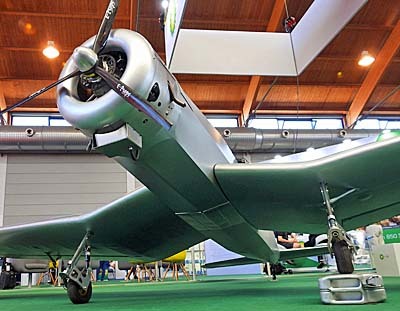 Two years ago at my favorite European airshow, Aero Friedrichshafen, Bill Canino of Sportair USA urged me to go look at a cool Part 103 project. With a general appearance resembling a Chance-Vought F4U Corsair military fighter, designer Jörg Hollmann‘s ultralight Corsair is reasonably authentic including its highly distinctive inverted gull wing design. Two years ago when I saw the bare bones example — exhibited for this small shop design and manufacturing organization in BP Oil’s display stand — it was easy to get excited by the concept but less obvious to imagine how it might eventually look. 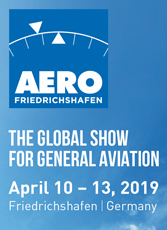 At Aero 2018 the visual mystery was solved. Anyone who has admired F4U Corsair’s angular wings will be drawn to ultralight Corsair. 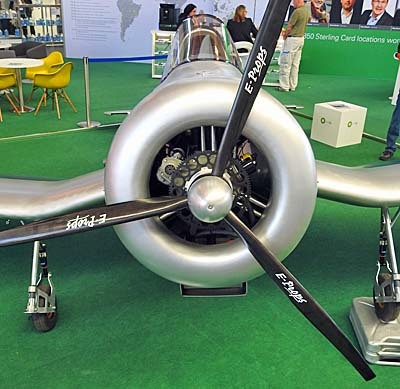 Even the engine mimics the original’s Pratt & Whitney R-2800 Double Wasp, except at ultralight weights and power. 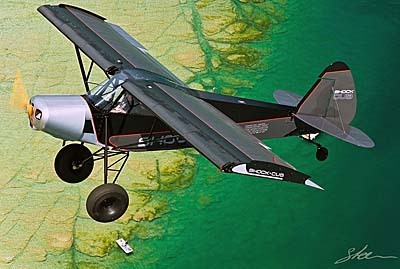 Jörg chose a three-cylinder Verner radial to power his diminutive aircraft. Get Ready to Party with DUC Props Like It’s 2017! 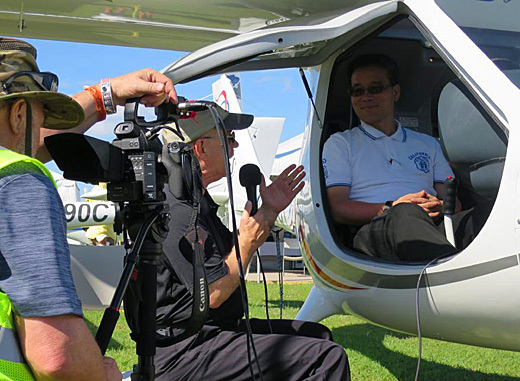 Watch our video interview coverering the line of DUC props. If you live in France or are traveling to the country (soon! ), you might want to join the party... the DUC Propellers party, that is. It is happening in a few days. In December 2016 DUC Propellers moved new facilities (nearby photo) to be closer to the airfield for tests and to have a more spacious infrastructure to expedite development. To celebrate their new quarters, on Saturday, June 24th, 2017, DUC Propellers announced they will "organize an exceptional party to celebrate the inauguration of our new location on the Villefranche-Tarare Aerodrome (LFHV) in Frontenas, France." 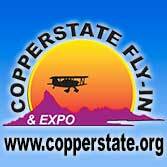 They plan a big event with more than 500 guests expected along with participation of many operators from the airfield. "Lot of guests will arrive all long the day by plane but the party will officially start at 8 p.m. with the visit of the new facilities, a photoBooth on flying topics, a Beaujolais culinary discovery, a cocktail dinner, a music DJ, and some animations throughout the night," said DUC representatives. Contact DUC if you want to participate to their special, private event. 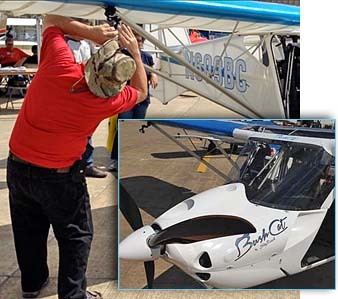 The good news is, DUC props are available in the USA thanks to SportairUSA. 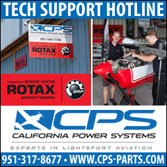 You know this brand for their aircraft, including Sting, Sirius, and Zlin Outback and Shock but they are a full service supplier. The Arkansas company said, "SportairUSA is the United States distributor for DUC Propellers, the industry-leading forged carbon propellers from DUC Helices. 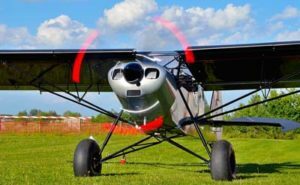 There are models of DUC propellers suitable for light sport aircraft, ultralights, powered parachutes and experimental aircraft." Plus, how about this offer? 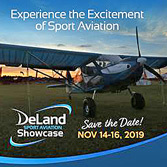 "Guaranteed Satisfaction — If your airplane does not perform better with the DUC propeller, return it within 30 days for a full refund," assured people at SportairUSA. 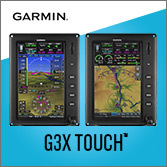 That is a remarkably sure way to know you are buying the right prop for your airplane. 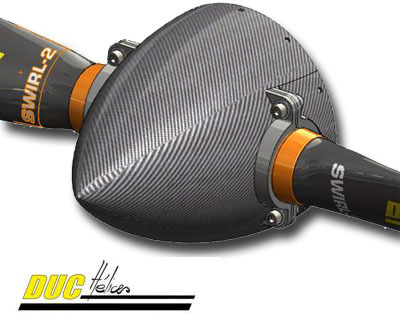 SportairUSA lists some of your choices in props from DUC. 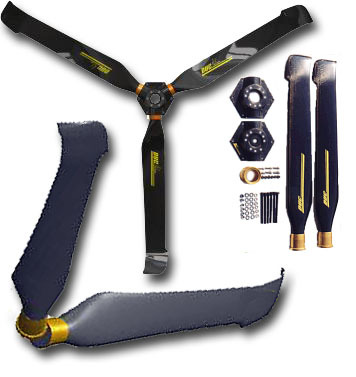 Swirl (photo above) is a simple, ground-adjustable propeller that performs like a complex constant-speed prop. 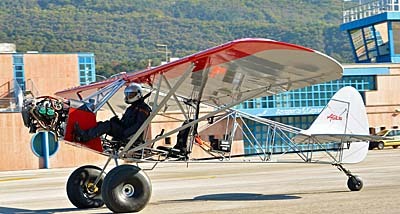 "It is the propeller of choice for faster airplanes," said SportairUSA. How can that be? "Without movement or twisting of the blades DUC's Swirl propeller has a constant speed effect… [because] the prop takes a slimmer bite under load, and a fatter bite when cruising, without the need for complex electro-mechanical adjustments." Windspoon (lower photo) is for slower aircraft (speeds up to 80 knots for engines up to 120 horsepower). 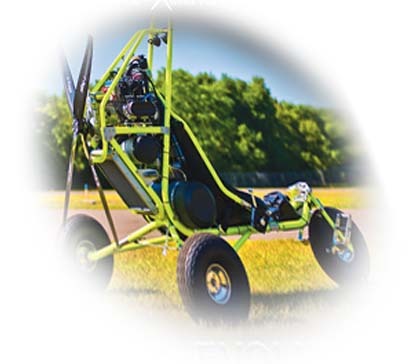 SportairUSA explained, "With its revolutionary shape [that] offers unrivaled performance, Windspoon is the ideal solution for trikes and similar aircraft." 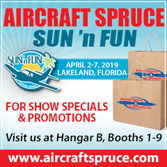 For more detail including specifications and prop ordering information, visit SportairUSA's dedicated prop page. If you live in France or are traveling to the country (soon! ), you might want to join the party… the DUC Propellers party, that is. It is happening in a few days. In December 2016 DUC Propellers moved new facilities (nearby photo) to be closer to the airfield for tests and to have a more spacious infrastructure to expedite development. 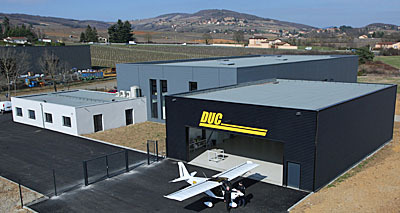 To celebrate their new quarters, on Saturday, June 24th, 2017, DUC Propellers announced they will “organize an exceptional party to celebrate the inauguration of our new location on the Villefranche-Tarare Aerodrome (LFHV) in Frontenas, France.” They plan a big event with more than 500 guests expected along with participation of many operators from the airfield. “Lot of guests will arrive all long the day by plane but the party will officially start at 8 p.m. with the visit of the new facilities, a photoBooth on flying topics, a Beaujolais culinary discovery, a cocktail dinner, a music DJ, and some animations throughout the night,” said DUC representatives. 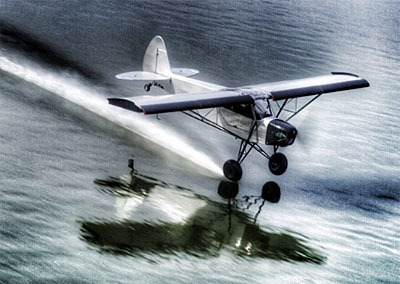 Here's an airplane almost certain to grab your attention. It has huge power (180 horse Titan X340); a "hyper"STOL wing; double Fowler flaps; tremendous shock absorption, including on the tailwheel; and enormous tires. It's also finished extremely well and has every little detail done just right. 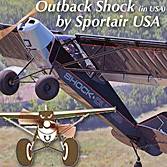 Outback Shock, the U.S. name for this model from longtime producer, Zlin, has entered a sub-sector of the LSA world with some stiff competition but Outback Shock meets the bet and raises the others one or two. Video shot at Aero 2016 at its debut.